My little sister has more t-shirts than anyone else I know (it may have something to do with the fact that she's the athlete of the family) plus recreation major=lots of t-shirts. She also has a sentimental attachment that prevents her from throwing most of them away (never mind that I wore a camp t-shirt to bed last night from 1993). So, for her birthday I told her I would make her a t-shirt quilt. 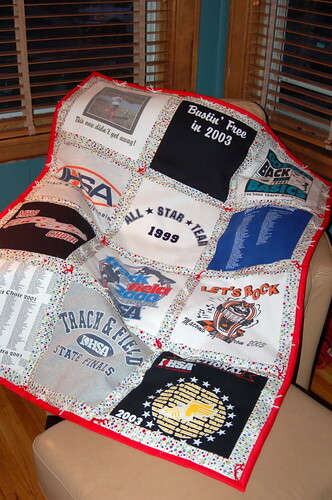 Having never made a t-shirt quilt before, or any quilt for that matter, I did what anyone would do - I 'googled' it. After reading several tutorials and watching a couple videos on 'binding attachment' I finished the quilt in under 14 days. I still didn't get it to her on time, but I think it was worth the wait. The most time consuming part by far was attaching the fusible interfacing to each shirt to keep it from stretching during sewing. And because I'm cheap, I only allowed myself less than 1 inch of extra interfacing per square which meant painstaking measuring. 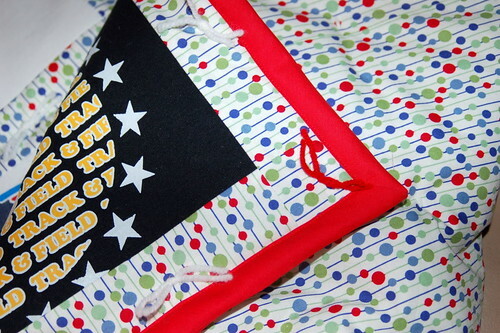 All in all it was a very satisfying project, and a great way to preserve memories (if you don't like to use your old t-shirts as pj's). As always, more pics here.